Welcome to Day 11 of the 12 Days of Holiday Inspiration Blog Event brought to you by "The Inspiration Crew". This card was inspired by Lesley Croghan. In fact I bought this set because of Lesley's card. I loved her watercoloured, loose look and waited impatiently for the set to arrive. I decided to use one of my favourite techniques to make this sparkly and glossy. I call it "Faux Cloisonne" (I'm sure you're impressed with my French!) and I do it by heat-embossing an image, colouring it (with copics in this case) and then smearing Stickles all over it. It's a bit of a messy technique for me, but I always love the sparkly results! Remember to visit all the crafty ladies for loads of fun Holiday craft ideas. Ardyth this is stunning! I read the post a couple of times because I was trying to figure how you did this without getting messy--I know you so well. Keep on coming on with the stickles! Gorgeous Ardyth. Oh Ardyth, this is beyond divine. Great use of that gold, shimmery embossing. It makes the red just pop right off the card and makes your card feel so elegant. Gorgeous poinsettia. Love the gold embossing. This is beautiful, Ardyth. I may have to try that Stickles trick - after I get some Stickles that isn't sparkly. Beautiful and I like your technique. Beautiful!!! Well worth the messy fingers and work space! GORGEOUS sentiment, perfectly placed! 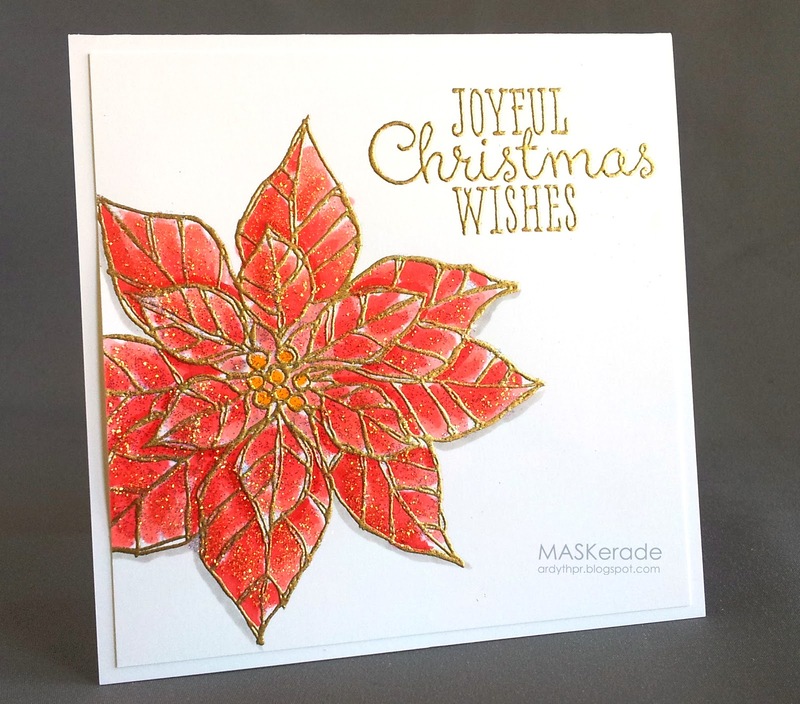 Gorgeous poinsettia and your coloring, about as perfect as it can be. I love it. And I love Geri's eye shadow idea...might have to remember that for future gifts.